Samsung launched its new flagship smartphones, the Galaxy S8 and Galaxy S8 Plus, at its Unpacked 2017 event on Wednesday in New York, with both IRIS and Facial Recognition features, making it easier for users to unlock their smartphone and signing into websites. 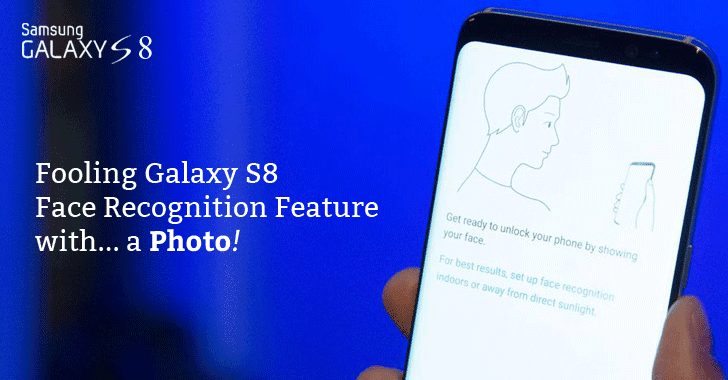 All users need to do is simply hold their Galaxy S8 or S8 Plus in front of their eyes or their entire face, as if they were taking a selfie, in order to unlock their phone. Biometric technology – that involve person's unique identification (ID), such as Retinal, IRIS, Fingerprint or DNA – is now being integrated into more consumer devices for improved security. But, we have seen a number of hacks involving Biometric security systems in the past, which prove that fingerprint scanner and IRIS scanner are less secure than a passcode and can be fooled by anyone, perhaps, using a photograph of the user. But how secure is the built-in sensor from Samsung to allow for facial recognition? Not so much...at least for now. I was wondering if the new facial recognition integrated into Samsung's Galaxy S8 and S8 Plus can be fooled into unlocking a device using a photograph of the device owner, and somebody just made it possible. YouTube vlogger iDeviceHelp posted a video on his channel, in which Marcianotech demonstrated that unlocking a Galaxy S8 or Galaxy S8 Plus is as simple as getting the device owner's picture from Facebook and waving that photo at the phone. It is unclear, at this moment, as to how precise the photo used in the demonstration should be compared to the real face? Or at what distance the phone was held from the camera? Or what angle they chose during the registration of the recognition? But what's clear is the fact that a gap remains in the security system of the Samsung's new facial recognition feature. Moreover, there are reports that Samsung’s Galaxy S8 would include a facial recognition feature for mobile payments in the coming months. The company has yet to comment on this issue, so we hope that this is because the software is still in a demo state for now, or maybe it is just a bug that Samsung will be addressing before the device ships out on April 21. Whatever be the case, the Galaxy S8 and S8 Plus do offer other security tools, including IRIS scanning and fingerprint scanning, as well, so you'd rather use these security features to unlock your device, or simply your passcode; instead of the facial recognition, for now.